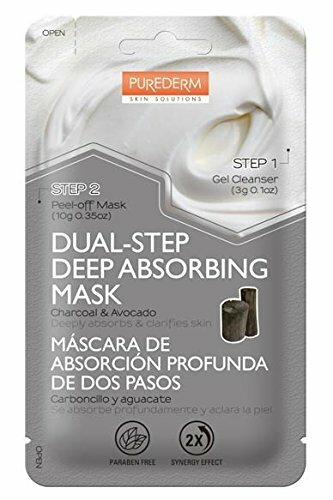 Purederm Dual-step Deep Absorbing Mask, containing Gel Cleanser(Step1) and Charcoal Peel-off Mask(Step2), combines the benefits of cleanser & mask for maximum skin care results. Step1 : Gel Cleanser is concentrated with Honey, Lemon & Bambusoides Juice, this mild cleanser deeply cleanses and gently refines pores remaining skin smooth & healthy. Step2 : Peel off Mask Gently peels away impurities and dead skin cells while Charcoal Extract absorbs toxins and draws out pore clogs. The mask allows natural ingredients to penetrate deep into the pores to increase skin clarity.How to Use1. Wet face and hands with warm water.2. Open Step1(Gel Cleanser), apply the product onto hand and work into a foamy lather. Massage lather onto face with a circular motion.3. Rinse with water and open Step2(Peel-off Mask).4. Apply the mask in a thin & even layer. Leave for 15 minutes or until it has completely dried and slowly peel off (never PULL) the mask from the bottom of your face.5. Rinse with water to remove any residue. Follow with your skin care routine.